With so many products to choose from when it comes to roof repair, homeowners are sometimes confused which ones are effective and which ones are not. There are also products suited for specific types of roof while others are more versatile because they can be used for a wide variety of roofing materials. In this article, we examine one of the better-known products in the market that claims not only to patch up your roof and effectively stop leaks but to do its work quickly and without fuss. This is the Cofair UBW425 Quick Roof Ultra Bond with Steel-Loc Adhesive. Quick Roof Ultra Bond is available as a roll type adhesive that is marketed to permanently repair leaks on different roofing materials, including EPDM, metal, PVC, modified asphalt, wood, tile, TPO, vinyl and fiberglass. The product is self-adhesive and may be applied to damp or even wet surfaces. Its manufacturer guarantees the product will not crack, shrink or harden when properly applied. 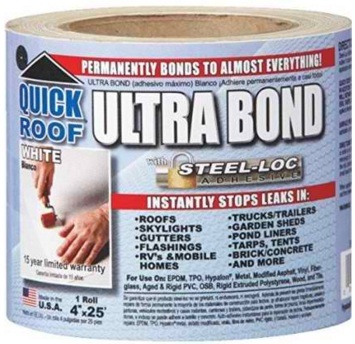 Quick Roof Ultra Bond may be used not only on cracked and leaky roofs but also on other parts of the house such as flashings, gutters and skylights. In fact, because of its form—an adhesive roll—it may also be used on mobile homes and RVs, trucks and trailers, tarps and garden sheds. Most customers who bought the UBW425 Quick Roof Ultra Bond are satisfied with its performance. They particularly praised the adhesive strength of the product to stick to the surface. People who bought it used the product to repair different surfaces, including car trailers, asphalt roof, RV roof and rubber membrane flat roof. Another positive quality of the product that customers rave about is the convenience and ease in which it can be used. Most customers were literally surprised how easy it was to use the adhesive tape. Quick Roof Ultra Bond was used on different surfaces and under various circumstances. Some cleaned first the old materials used on the roof before using the product. Others applied additional liquid sealers on top of the adhesive. One customer used it on joints between the roof and metal flashings. Its positive performance was overwhelmingly recognized after customers noted the absence of leaks after heavy rains. Apply a primer first over the surface before using Quick Roof Ultra. The stick factor is apparently increased by the primer. Cut the tape in manageable lengths, especially if you are working alone since it could twist up and become unusable. Use a roller to flatten the tape and improve its adhesion process.